I invited you to lean into this DOMESTIC sphere in all its homely undoing; to rupture the masquerading shape of cosy bliss; to plant seeds and haunt with your words; to unsettle and shape what survival looks and feels like – and you did. You lured me into other-worlds with your heart-on-sleeve, body-on-the-line words; a DOMESTIC fever-immersion that broke my heart and made me rage, laugh out-loud, question and delve deeper when I needed to know you more. You kept me awake. You got under my skin. None of it was easy. This collection bears witness to a profound, unsettling ‘intimacy’ situated in relation to the interpersonal relationship domestic sphere; and to global processes and neo-colonial connections that manifest culture and power. Such ‘residual’ and ’emergent’ intimacies1, exist beyond time and place, where dominant worldviews and systems continue to shape environments, movements and societies today; where history seethes quietly and persistently into the future. Here, the liberating power of poetry is a means to contest and potentially shift or transform oppressive ideas and dominant ways of knowing. The poets here are active and affecting in their refusal to accept what is imposed as inherently universal, or inevitably inherited to the future. As their words unfold to make new meaning, intimacy on the DOMESTIC front can be understood to mean almost everything. Here, domestic is home: loving, nostalgic, troubling. It is that place frozen in time with grief, fear and longing and where memories are triggered. The kitchen is significant. Survival is knowing how to use a carving knife and where the heavy saucepan artillery is kept. Bedrooms and lounge-rooms retain moments that key change and shift through an astute knowing of where and how to position oneself in rooms that confine and choke. It is a house reclaimed and demolished, tending to spectres and mundane objects that remain in the debris. It is the irony in Misogyny-Speech tea-towels, and the chaotic filth-confessions of poets in lairs. It is hiding under tables. It is a women’s shelter night, and a child’s money-box raided for vending-machine cuisine on the run. It is lifetimes in moments inhaled and freeze-framed. Domestic is clever knowing: the casual racism, stereotyping, scapegoating and cultural appropriation; the intergenerational fight to be seen, heard and recognised as sovereign First Peoples of Australia. It is a broken story: raw, gaping, mended and scarred. It is estrangement and strange-entanglement; our abandoned mothers and our children alienated / dead / missing. It is walking small-town streets, searching for recognition in the eyes of strangers; the serendipitous-search for family found over shop-counters, and the arrival home. It is intimacy with country, travelling between sliced stone mountains and returning to important bodies of waters and lands when we die. It is protest ignited and bushfires burning in our eyes. It is cultural survival through the language of food and paying homage to grandmothers; to their bountiful gardens that keep blood-memory, love and culture alive; and to their return as they finally walk barefoot and seep into that place where two lakes kiss. Domestic is war: reliving horrors of Auschwitz in the gaps and remains of small-talk with skin-head tradies fixing floors. It is the defence of Palestine and the sound of drones tearing hair from mothers and lands. It is unpacking a suitcase of behaviours, accents and smells to settle diaspora’s flux, tracing back through lands, time and recipes; piecing together fragments, damaged and whole. It is terror’s war and refuge and a refugee’s flight. It is blank-eyed children looking after children and the psychological trauma of detention centres. It is criminal. It is a river’s dried-bed, and washing away the evidence of monsoons, mushroom clouds and cultures. It is taking routine lessons in your domestic waters on how to float safely on your back so you might survive the flooded wake of the next typhoon. It is the war on waste. It is capitalism’s toxic consumerism, hyper-hygiene-madness and a supermarket’s fruit wrapped in plastic. Domestic is love: it is growing into each other’s skin; it is conditional, and the tortured realisation that a line has been crossed. It is violence disguised as love. It is about control, being out-of-control, being weak and insecure. It is obsession. It is a trace of blood through blunt-force injury. It is knowing homophobia and the back of your shoulder like the back of your hand. It is sexual assault, the objectification of women and fight-flight strategic survival. It is suffering a suffocating holy-matrimony and the ability to talk yourself alive. It is becoming the mother whose apron-strings you severed. Domestic is family: a bi-polar journey, it is boxes and categories, defying fixed-identities and multiple subjectivities. It is making dinner-plans on the hop in predictive-text hilarity. It is care-giving and aging well and un-well, and that crashing moment when you can no longer remember, or you are no longer visible to the one who sees you best. It is birthing, sleep-deprivation, post-natal depression and melancholy. It is a rite of passage and hormone-fuelled hate; an impossible present and the more impossible future without him or her, and having to return. It is nostalgia; a yearning for connection, for what used to be or could possibly be. It is raising children; it is sacrifice and poverty and making meals out of thin air; it is finding old letters of Champions to ground their humanity; it is clear eyes fixed on the absent once present, and the last broken one to look away. Domestic is the Ultra-White Flour in a country-town’s Reconciliation Week scone; it is a Black Mary servant girl’s Christian mission indoctrination; it is the raw sound of mourning and evolution’s death rattle; the base-line for a heart and a call-in from a past that warns … it is acts of protection that find ways to hold close and hang on. Domestic is servitude: a history of indentured Aboriginal labour. Slavery. A black-breasted-wet-nurse’s life-giving sustenance. It is stories in tea-leaves and tea gone cold with half-empty hearts. It is dust wiped from surfaces and being threatened by Master Six over spilt milk; it is holding family and culture close to your linen apron-bound body. It is never being invited to sit to lunch. Domestic is skin: it is black / blak / brown / white and drinking bleach in sick melanin-madness. It is fetishised and objectified; wanted, touched and possessed. It is defying shame; loving your skin, your face, your neck that once held chains. It is queer pride and flying free from cages. It is loving your beating heart. So much poetry. My hope is that you will read and bear-witness to all that is shared and exposed here, complicit in this vision to do something else with it all; that you might delve-deeper to act and contribute to the emergent / urgent shift that is required on so many DOMESTIC fronts; that you will be compelled to work toward something-else honouring, hopeful and loved; safe and just and whole. To walk free. No fear. This entry was posted in ESSAYS and tagged Natalie Harkin. Bookmark the permalink. 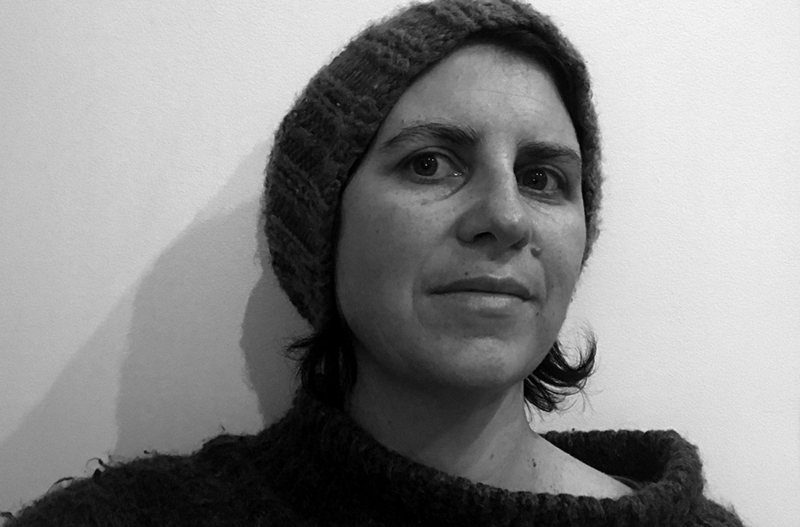 Natalie Harkin is a Narungga woman and activist-poet from South Australia. She is a Research Fellow at Flinders University with an interest in decolonising state archives, currently engaging archival-poetic methods to research and document Aboriginal women's domestic service and labour histories in SA. Her words have been installed and projected in exhibitions comprising text-object-video projection, including collaboration with the Unbound Collective. She has written for Overland, Southerly, TEXT and Cordite, and her first poetry manuscript, Dirty Words, was published by Cordite Books in 2015.